A. Viagene Biotech provides hundreds of EMSA kits and EMSA-related products, more than any other companies (check) . B. 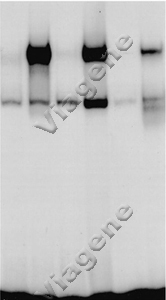 For detecting a specific nucleic acid-binding protein, Viagene Biotech is a only company to provide three types of technologies (gel-stain EMSA, ECL/biotin EMSA & IR Fluo- EMSA) for customers to choose (see the difference). C. Viagene serviced hundreds of customers and performed thousands of EMSA with samples from plants, rice, fish, bacteria, fungus, animals and human cells and tissues, #1 in the field for EMSA technical services. D. 10 years ago, Roche sold a DIG EMSA kit without probes, not for any specific protein ( see comments), Pierce sold a ECL EMSA kit without trans-membrane and probes, not for any specific protein (see comments), and Viagene Biotech sold kits with probes for targeting specific proteins and pre-set binding condition, which would be much easy for customers to use. Viagene, now, provides 100+ kits (see the list) for different protein factors. E. Viagene is a only company to provides largest information for troubleshooting EMSA problems (detail). F. Viagene provides more EMSA products than other companies, and sells EMSA kits and probes at prices cheaper than other companies (detail). G. For more than 10 years at EMSA business, Viagene Biotech has acuminated more than 100 ready probes & kits, most of them have been tested. More recently, kits & probes for targeting mBurnx1, Burnx2, GLI(1), GLI (2) , GLI(3), Smad3, Smad4 and Blimp-1/PRDM1 have been added (detail). H. Viagene Biotech carries more EMSA positive/negative controls (check) such as NFkB/NF-kB, AP1, SP1, OCT1, OCT2, HIF, NRF2, GATA, STAT1, STAT3, STAT5, WT-1, EF2, P53 and Blimp-1 etc., than any other companies. I. If customers run into problems with EMSA and cannot find solution from other companies, we may help to solve problems (see the cases).